Data world? 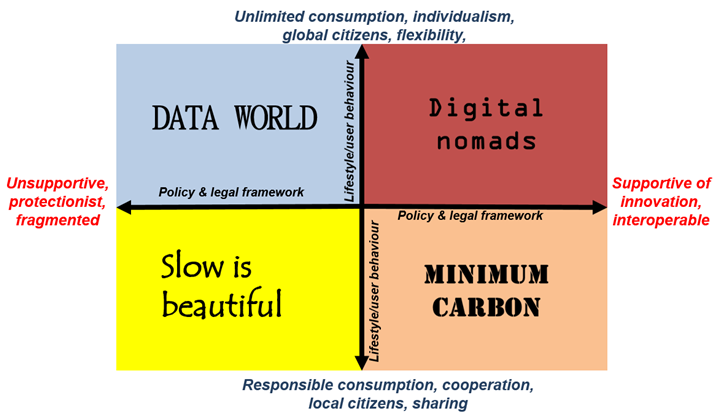 Digital nomads? Slow is Beautiful? Minimum Carbon? Scenario building is the first step in the Multi-Actor Multi-Criteria Analysis (MAMCA) methodology, which is used to involve a broad range of stakeholders in the Mobilty4EU project. We work with narrative scenarios (i.e. textual descriptions of potential future development paths) to identify the vision for transport in 2030 and devise an action plan. Each scenario is a description of future trends and technological, organisational or policy-related solutions. Based on a survey of 33 stakeholders, we selected policy & legislative framework and lifestyle & user behaviour as pivotal uncertainties (i.e. trends that have the highest uncertainty and the highest impact) to steer the scenario building. Harmonisation of regulations and technology standards at the European level is limited. The activities of companies in the transport and mobility sector are less strictly regulated but support for innovation is also limited. Innovation mainly comes from private companies, which collect, own and manage transport data. People are becoming increasingly flexible with an accelerated pace of life. Individualisation leads to smaller household size and flexible employment. This scenario mainly includes solutions that increase efficiency and profitability of private actors in transport and enable large private corporations to provide integrated mobility services. There is a high level of standardisation of regulations and technology standards at the European level. The activities of companies in the transport and mobility sector are more strictly regulated. The boundaries between private life and work disappear as people become always online and available. The solutions in this scenario enforce cooperation between private and public actors to reduce carbon emissions and increase energy efficiency. Full digitalisation and automatization of the transport system is supported by government regulation and funding. Integrated mobility services are strictly regulated to provide a balanced set of transport options to users. European policy focuses on enabling local initiatives rather than supranational standardisation. Innovation is less supported due to scarce financial resources. People more and more turn to eco-friendly local cooperative production of food and energy, urban gardens and peer-to-peer services. Bottom-up initiatives of local communities thrive with few legal limitations on local sharing and production initiatives. The solutions in this scenario aim to restrict local road traffic and enable local initiatives to share mobility resources. The approach to digitalisation and automatization is more cautious. Due to the severe pressure of climate change governments want to fundamentally change the behaviour of their citizens and companies to steer them to reduce carbon emissions and move them away from fossil fuels. Burn-out from fast-paced work have turned people towards healthier and active life. The solutions support strict regulation of carbon emissions both for freight and passenger transport. The focus is on reducing travel demand and provide accessibility to work and services within local self-sustaining neighbourhoods. The next step is the evaluation of the impact of the scenarios on the 14 stakeholder groups that we identified. For more details about the scenarios and the scenario building please consult the technical report.